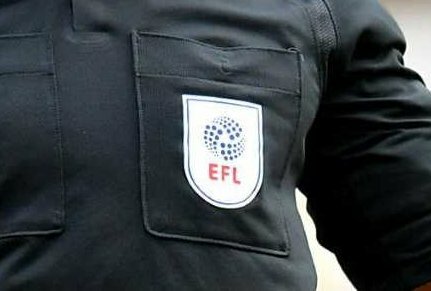 The man in charge of our Tuesday night game in Milton Keynes will be . . . .
Michael is the son of referee Graham Salisbury and this is just his second year refereeing in the Football League although as an assistant referee he has been involved in games throughout the leagues and Premier League as well as being involved in Europa League Qualifiers and the EURO Qualifiers. This will be the third time Michael has been in charge of a Rotherham game – the twice before being this season. The first time was on 12 August this year when a Kieffer Moore hat-trick plus goals from Joe Newell and Ryan Williams saw Rotherham beat Southend at the New York Stadium. Newell and Moore saw yellow that afternoon as well as the visitors Simon Cox. Last month saw Michael in the middle for our two-nil home win over Wimbledon. The game was just less than a quarter of an hour old when Michael Smith scored the first goal, the second one coming two minutes into time added on at the end of the game when Michael Ball scored from a re-bound after Ryan Williams saw his shot saved. So far this season Michael has been in charge of thirty games showing sixty-eight yellow cards and four red cards. Running the line on Tuesday night will be . . . . The Fourth Official will be . . . .